Inquisiq is the ideal Learning Management System for small to midsized businesses in all industries including training companies who wish to sell courses online. Comments: We love Inquisiq and we love ICS Learning Group! Pros: Inquisiq has allowed us to implement our learning structure, and it has offered several different ways to do so. There seems to be many different ways to set up the system to meet our needs. The interface is user-friendly and very attractive. We especially like the mobile responsiveness in the latest version of the software! The support team is fast and helpful in addressing any questions or concerns that we have. When we ask for new features in the LMS, they actually listen to us and pass the requests up to management, and we have even seen some of the things we have asked for implemented in the software! Cons: The LMS's ability to cater to so many different scenarios and companies can sometimes be a drawback. The many different implementation paths that we could take to execute our goals can be intimidating. However, the support team is always extremely receptive to getting on the phone with us to discuss our options and help us form an implementation plan that works for us. The team's subject matter experts' deep understanding of the system helps us to narrow down options to help us set up our system in a way that best fits our needs. Pros: Other hosted LMS services require many $1000's, a commitment, and lengthy consulting before you are up and running. On the other hand, can be set up by you in a matter of hours for very little cost and no commitment. Cons: - Reporting is fair (new reporting options are coming though). Overall: Despite some limitations, I am very pleased with our decision to work with ICS and their Inquisiq product. I estimate that had we chosen one of the big three hosted LMS vendors; we would have spent an additional $15000 since March 2010. I am seeing constant improvements in the product and I am confident that which we consider shortcomings will be resolved in the near future. Since there is absolutely no risk with upfront costs and contract obligations, I recommend Inquisiq for small to medium sized LMS needs and possibly even for any large size LMS requirements. 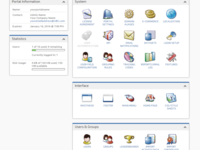 Pros: The system is extremely stable, easy to use and easy to upload SCORM files. Cons: Updates are not scheduled regularly or well documented. Overall: Great investment and exceptional value. You won't be sorry and you don't need a big but not "user friendly" system like SumTotal - why spend that kind of money and it doesn't work as nicely? Try it, you'll love it! Pros: eHealthSolutions has been quite pleased with our licensing of InquisiqR3. We needed to train several thousand customers in a very short period of time in order to support the federally mandated MDS 3.0 changes to our product. All users needed to be trained, assessed, and reported within a two week period before 10/1/2010. We accomplished this goal with relative ease hosting our training through InquisqR3. Cons: It would be super to have threaded discussion groups attached to courses - but there are ways to get around that. Overall: We investigated 13 other LMS vendors before choosing InquisiqR3 - I have ZERO regrets about our decision. This is a superior product, providing a great compromise of features and usability. A long list of features that you won't actually use will not help you to achieve the objectives of your programs. A system your team can use and will like working with is key to success in my experience. This product recieves my highest personal recommendation. Pros: The LMS is intuitive and not complicated. The system is consistently up which allows us and our customers to access courses and obtain tracking data easily. I love being able to login online to the Support Center and request assistance electronically. 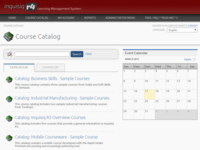 The ability to track training information and have access online is invaluable to our business and education customers. Cons: Tends to be somewhat more complex regarding the reporting features than the EX version. However, the features far outweigh this complexity. Overall: In addition to the reasons listed above, we see an even greater value in the support we receive from the ICS team on a minutes notice. The team is responsive and willing to help our team work through alternatives for our LMS applications. We are so pleased with our service and the abilities the ICS Learning Group offers that we wouldnt consider going to another LMS provider especially since we see them as honest and dependable business partners. The team treats you more like a business partner than a customer. 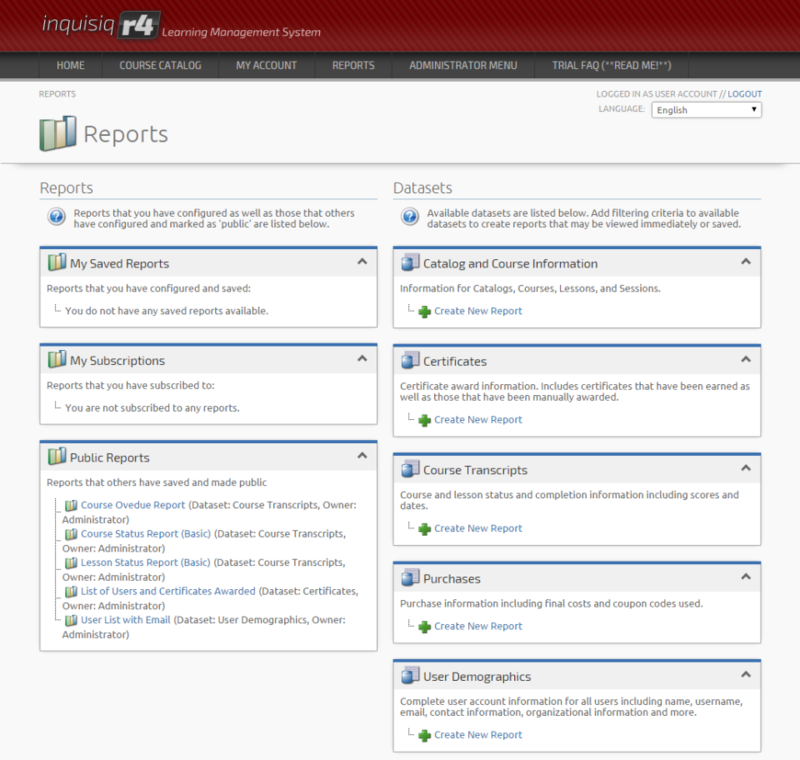 Pros: I love the simplicity of Inquisiq, it is without a doubt one of my favorite LMS platforms. The user interface is intuitive and easy for new users to understand, so I never had to train them on how to use it. Inquisiq has all of the main features of all standard LMSs without the extra headaches or over-complications. Definitely check it out if you're looking for an easy-to-set-up LMS with great support. Another perk is that the cost was very reasonable compared to other LMSs on the market, which is fantastic. Highly recommended! Cons: No complaints, the Inquisiq team always went above and beyond to help me out. They are patient and always provided rock solid support. Recommendations to other buyers: Do your homework! There are TONS of LMS platforms, and many have hidden charges or additional headaches attached to them. Use the Bersin LMS guide and read reviews from current users (via blogs, twitter, etc.). Pros: My company has been utilizing the SaaS implementation of InquisiqR3 and I can honestly say that it is the closest thing I've seen to a perfect LMS. The UI makes jumping in head first a breeze on both the back end and front end, it is feature rich without being bloated, it has an API for us developers, the actual software seems to have been thoroughly bug-tested, the customer service is unlike anything I've seen with any company period, not just LMS companies, and the pricing structure is great. They even offer a one-time license fee that breaks outside the pay-per-user/SaaS model that is very affordable for such a great LMS...could probably keep going, but these are the highlights. Cons: The only cons I could point to would be the maximum file upload size was only 200mb when we first purchased and this cause a few issues. However, given the great customer service, ICS was all over helping get through these issues and even modified the software based upon our needs. More documentation on the reporting would also be helpful, but I hear they're all over this as well. Overall: If you're looking for a well-priced, easy-to-implement, powerful LMS with built in e-commerce support... look no further, I won't ever again. Pros: Love the interface--simple and nice loooking. Ease of use is excellent for end users (five stars), but for administrators, R3 seems more complicated than previous version - Inquisiq EX (which is why we rated 4 stars). When we upgraded from EX to R3 and the upgrade implementation was very easy. Once we understood how the reporting works, we liked the flexibility of it. Customer support is helpful and responsive but we would like more explicit documentation. Cons: Two challenges from the administrators perspective is uploading batch users (specifically, the process for creating the upload file can be hard to get right). Uploading web-based self-study courses takes more steps than we would like. As mentioned above, we would like more explicit and detailed documentation support, especially for system administrators. Overall: The product is well designed and reliable. With the new features of R3 have come some challenges on the administrator side--could be the learning curve for us--but overall we are very satisfied with the R3 LMS product and with ICS Learning as a business partner. Comments: Several years ago, I relied on Inquisiq's LMS platform as the foundation for delivering blended learning, self-directed learning, and instructor-led training. I switched to Inquisiq from another platform and never looked back. The product and the people behind it are first-rate. The cost-benefit equation for Inquisiq is extremely good. Pros: A complete, high-performance LMS including SCORM support. Deep support by software engineers and sales folks who believe in the Agile philosophy of delighting the customer. Comments: We were looking for a cost-effective, scalable LMS to upload thousands of users from over 100 locations with various levels of a matrix organizational structure. Inquisiq was that solution. PROS: Easy to set up and use from an admin perspective if you have basic knowledge of LMSs and SCORM packages. User uploads are simple. Reporting is decent once you get the hang of it. Customer support is very responsive. CONS: Some reporting is time restricted. Gamification must lie inside your courses - there aren't a lot of options built into the LMS. Overall, Inquisiq is a great solution. It's not overly bloated like many LMSs, and you're not paying for options that you wouldn't use anyway. It's not a content creation solution, so you must be able to build your own content. I'd recommend Inquisiq to anyone that's looking for an easy solution that can be set up quickly and scaled up very simply. 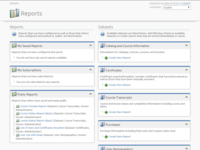 Pros: The intuitve design of the administrative back end is what has truly won me over to the R3 verision of Inquisic. Coupled with the fantastic support offered by the people at ICS Learning Group - our company LMS needs are one of the few things that we simply don't worry about. Cons: No appreciative cons to the product, particularly when compared with other available systems. Overall: After several years working with ICS Learning and now several months on the R3 flatform, I can't imagine that we would ever consider using another product or support vendor for our LMS needs. With over 5,000 users - reliability and robust funtionailty is imperative - so before switching to R3 visited the ICS Learning Group personally to meet the team - the trust factor only went up. Oustanding tool - Outstanding company. Pros: We like the product because it feels like a true "system" (as in "Learning Management System") to us. Other products we looked at felt more like "controlled access to a website" or "content dissemination systems" to us. Cons: We're using the Software-as-a-Service (SaaS) offering, so it's a subscription model. The pricing seems very reasonable to us, though the tiered approach (as opposed to a per-user approach) to pricing means at certain points there's a high price for adding "just one more user." Going from 250 to 251 users in the system, for example, bumps the monthly price by 60%. Recommendations to other buyers: If you're embarking on the LMS journey for the first time, as we were, keep in mind there's an internal cost associated with maintaining the new system. Even if the software itself is hosted elsewhere, as in this case, there will still be a certain amount of "care and feeding" to do--user management, course management, etc. Pros: Inquisiq is an excellent LMS, and it also happens to be super-reasonable when it comes to price. I always receive fantastic customer support from ICS, and I've become a raving fan based on my experience. Give them a shot - you won't be disappointed. Cons: One of the cons may also be a pro: Inquisiq is a fairly simple LMS. There aren't any unnecessary features or functionality that many LMS companies try to jam into their product. Inquisiq manages training well, and it doesn't try to impersonate any other HR systems. Overall: I highly recommend Inquisiq. Get a demo and discuss your needs with their team. I hope you're as pleased as I am! Comments: Our company, and myself as LMS administrator, have been using various iterations of ICS Learning Groups products for over 9 years now, most recently the hosted version of Inquisiq R4 since its release. We have never had a problem with it or suffered any outages. 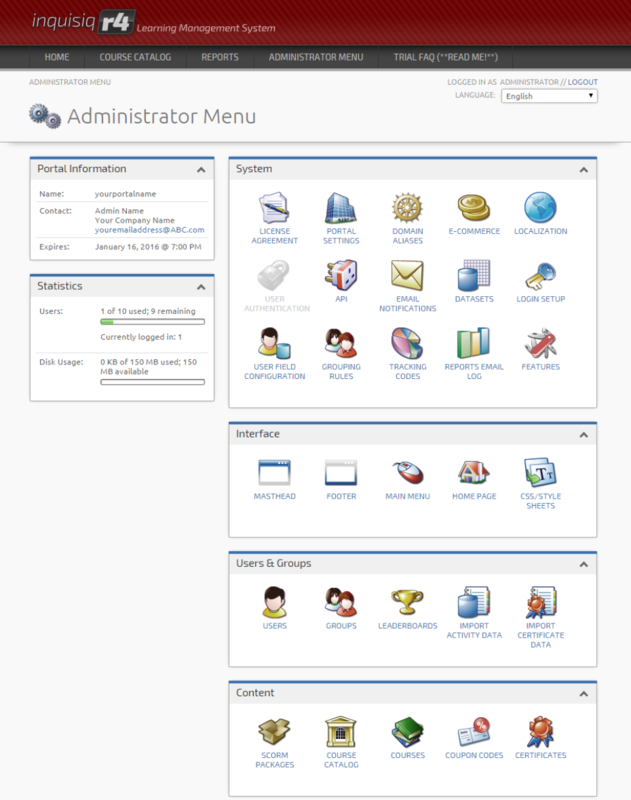 It is simple to use, has a very intuitive interface and makes the LMS management portion of my job a simple and painless process. Their support is second to none, and I can count on getting questions answered or problems solved quickly and efficiently. 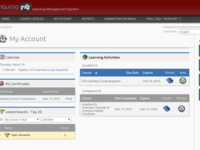 I would immediately recommend Inquisiq R4 to anyone considering setting up an LMS in the hosted environment. InquisiqR3 is a world-class LMS product which is designed, built, and supported in the USA. Pros: Stable SCORM implementation. Superior logical design and physical system implementation. Intuitive interface. Very high value for every fee dollar. Contract clear, easy, straight forward, with no long-term commitment. Vastly superior to Adobe ConnectPro in every category. Attentive and highly competent American technical support. Cons: D. Hughes & Co. has neither a complaint nor a significant criticism of InquisiqR3. Overall: D. Hughes & Co. has been extremely happy with InquisiqR3 since terminating our license with Adobe ConenctPro. InquisiqR3 should be your first choice. 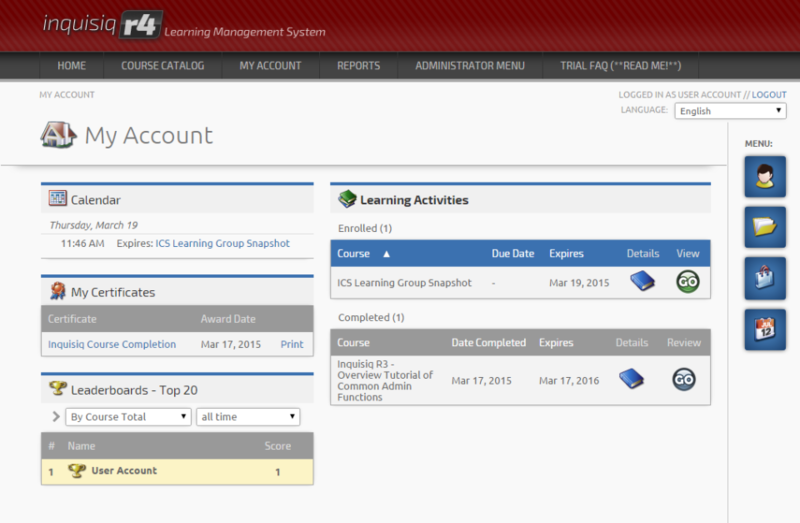 Pros: I spent months looking at learning management systems in detail before I selected one. Inquisiq R3 proved to be versatile, highly customizable and easy to use. I am glad I got it. Customer support is great. Cons: The user manuals are not as well organized as I would have liked, but customer support makes up for that. 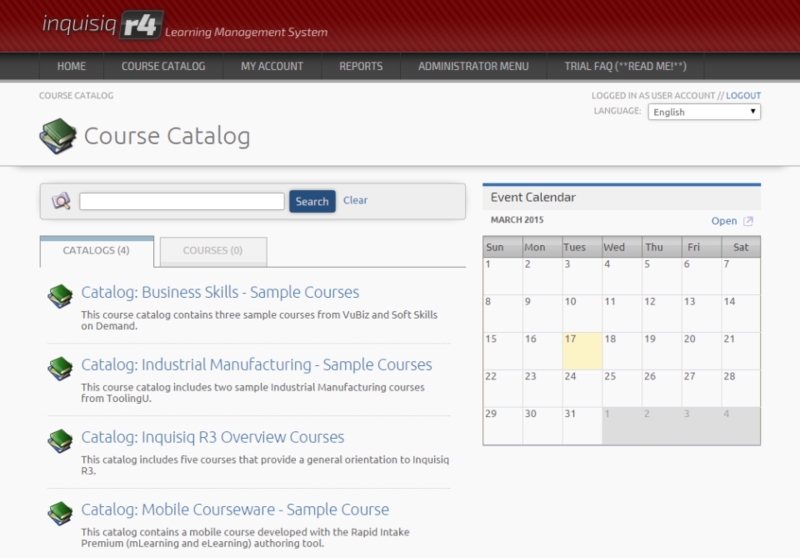 Overall: I have not hesitation in recommending Inquisiq R3 for someone who wants a pure LMS. Remember, though, that it is not a content development system and it doesn't pretend to be one.